I decided to bite my stagnant photography in the behind and went on a photoshoot-splurge today. Stand by for many, many belated FOs and outfits. Today, we’ve got a three-for-two! 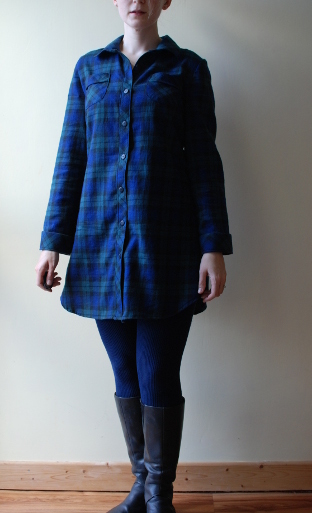 It’s the Bruyere shirt dress from Deer and Doe paired with the Sara leggings from Named. Let’s start with the shirt! 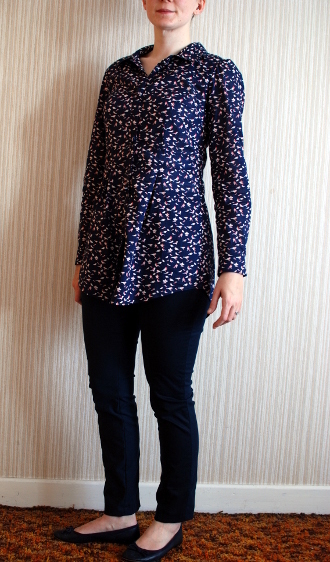 If you click through on the link to the shirt pattern, you’ll see the style lines much more clearly than on my shirt. It has a waistband with a pleated skirt coming out of it. I really like this idea because it leaves it open to you how long you want to make the skirt. I kept mine to the original length which is more suited to being a tunic. As you can see, there’s a really nice amount of ease all around the skirt. In terms of sizing, I cut a 36 for the neck and shoulders, 38 for the bust and tapered out to a 40 for the waist and hips. The fit across the back and shoulders is perfect but I need a tiny bit more room in the front so when I make this again, I’m going to add about an inch to the centre front between the neckline and the waistline. The way the button plackets and the collar are finished off is great. There’s a front facing so everything is enclosed and it gives an amazingly clean, but easy-to-control, finish to the centre front points. I like the sleeve plackets but I think they’re a little narrow to be able to control with total precision. I think for the next time, I will add a bit more width to the piece. What about those leggings, hmmm? I dared myself to make them. What an insane colour. I was hoping it would be darker than it turned out and then put off making them up because of it. By happy coincidence, it matches the fabric of the shirt perfectly so I had to make them! I was really inspired by Novita’s version and used her adjustments as a guide. However, they turned out pretty short! Who knew that you need to bend your knees! I still really like them though. The fit looks pretty good across the back but I had to take out about 6cm of excess after I put in the zip. Unfortunately for stretch materials, especially for fitted pants, it’s impossible to truly judge the fit until you have the zip in. Rather than take everything apart, I just removed the excess at the zip, which is why it doesn’t lie totally flat. For my next go at these leggings, I didn’t remove any length at all. I left the front pieces alone but removed the 6cm evenly through the back pieces. They’re a little snug at the waist but I think given fabric’s tendency to loose its elasticity, they’ll probably wear in to be a good fit. Fingers crossed! Here’s what they look like with just a normal pullover (from the shop… forgive me…). If you’re interested in having a go at skinny pants, these are a really good place to start. Generally, I’ve found the Named patterns to be excellently drafted and well-fitting. These leggings take into account the stretchy nature of your fabric so don’t be put off by the finished measurements. They’re very straight forward to make, with just two pieces for the front and two for the back. There’s the centre back zip – I just used a normal one because my bum is usually covered. The only thing that makes them not a lightning-fast make is the top stitching down the front and back seams. You could totally forgo this. I personally like that detail so I did it both times. I got smart on this pair and instead of just tacking down my facing like I did on the peach ones, I stitched in the ditch at side and centre front seams. This means I stitched right into the seamline from the right side to invisibly attach the facing. Errr… it’s not very comfortable. I could barely close them! They fit much better since I took out that stitching and just tacked the facing down like a normal person. If you’ve made it this far, thanks for sticking with me and I’m really excited to share all my FOs from the last few weeks with you! What sort of September would it be at all if I didn’t make a pair of shorts?! Luckily for me, it’s been a warm and beautiful month. 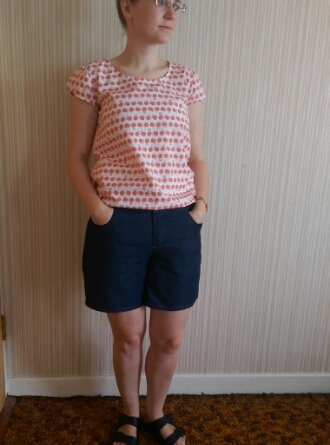 The pattern is the Grainline Studio Maritime Shorts. 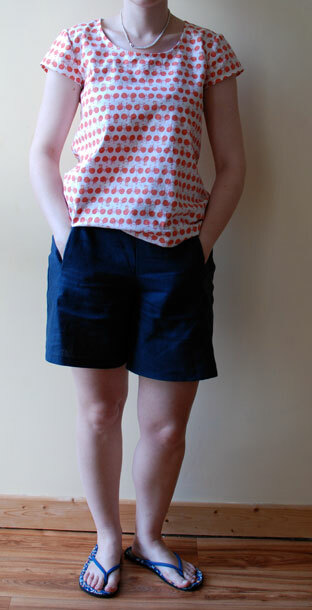 The fabric is leftover light denim from a shirtdress I made over the summer. I lengthened the leg about 5cm and tapered them in so they weren’t so square at the hem. I cut a size 6 so it’s a little snug around the waist but perfect everywhere else. I’m really happy with how the stitching on the back pockets came out! I finally took the plunge and bought an edge stitching foot. I have one that is an original part for my machine but it can only be used when stitching along an actual edge, like on a collar. You can’t use it for top-stitched edges that are in the middle of the garment. Anyway, it’s really easy to use and I can get pretty consistent results already. It’s a Sewaholic Hollyburn Skirt. I’ve made others but I think this might be my favourite yet! It’s a wool-polyester blend that I got from Truro fabrics about this time last year. It’s quite a floppy weave so I’ve attached the lining to each piece to give it more structure. This will give you an idea how I worked the pocket. 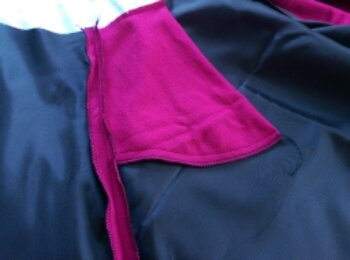 I overlocked the lining to each piece before sewing stuff together, it works quite well. That’s it for today, enjoy your weekend! Managing to sneak in with this just before the end of October. Phew! I’m feeling extremely frustrated right now because I spent quite a while taking lots of photos of all the things I have finished up since I last posted… but 75% of them were out of focus. I use an old camera of Alb’s because it has a remote control but when I take out the battery to charge it, the settings on the camera reset. Oh well, lesson learned! At least I realised before I had completely finished and so have a few things to share today. My most recent finish was this cozy outfit. 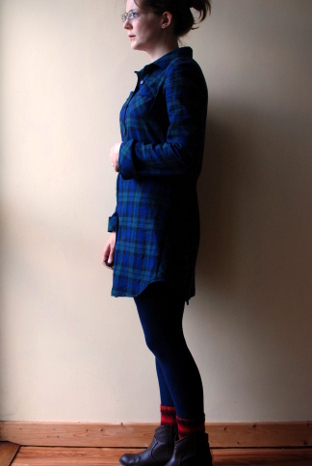 I showed the flannel in my last post and here it is, as a shirt/tunic. Pattern: Simplicity 2246 (Lisette Traveller Dress). I’ve made a few of these Lisette patterns and I love them. Sad to say, I think most of them are going out of print, so if you’ve been hmming or hawwing about picking up one, do it soon. What I love most about them is that they are a true petite fit. I am about a 35″ bust and picked the size for 36 1/2″ finished measurement – it fits great and has enough room for a long-sleeved top underneath should I so desire. I made a few modifications, but I kept the recommended length of View B, the tunic. I cut an extra cuff piece on the bias, traced off the bottom bit of the sleeve that’s meant to be turned up. I also lengthened the sleeve so that it’s full length and that the cuff stays turned up. You may be able to make out from the photo, I also cut the pockets on the bias. 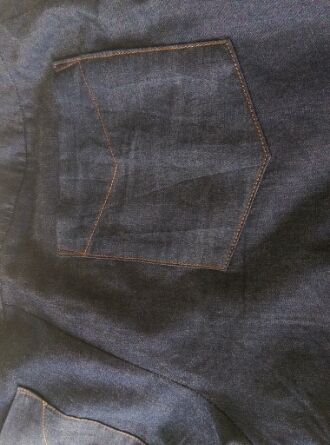 I’m not a huge fan of sewing on pockets, mostly because they’re exposed and difficult to get exactly right. These took me a long time to get to my liking. In hindsight, I should have used a very light interfacing for the whole pocket to keep it from stretching out. 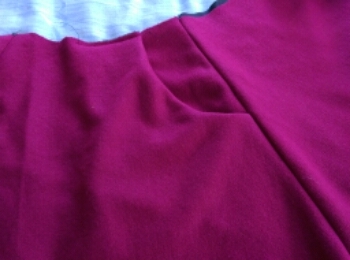 None of my photos that are in focus show an extra modification I added – a wedge piece at each side seam at the hem. I tacked the sides together to check the fit before I overlocked it and found it very tight across the hips. If I wanted a straight skirt on the dress view, I guess it would be ok to let it out a bit from the waist down. But for a tunic, I need to be able to move freely, so I added in a wedge tapering from the waist out to about 10cm at the hem on each side. This alters the overall silhouette, making it a bit more baggy than intended, but I think that adding a belt will help. 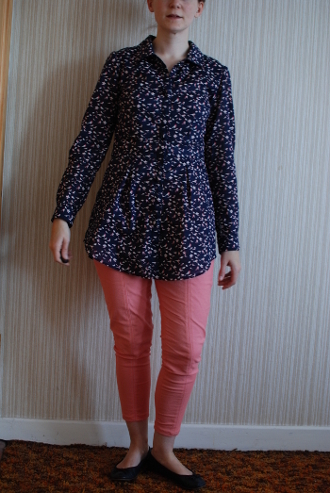 The other part of this outfit is the leggings! I have never made leggings before and truth be told, I am suspicious of the whole leggings-as-pants trend. However, whilst looking for something completely different, I came across a large selection of Jodhpur material on Textile Express. It is pretty much what you want for leggings, you know? I never really thought about it before then. I bought 2m since it was so cheap which is enough for a test pair and then another pair in case the test goes badly. I used the Espresso leggings pattern from Sewing Cake. It’s more a template based on measurements that you take yourself. I was intrigued, to say the least. I sewed them mostly straight on the overlocker, using the machine only to sew down the hems and waistband, so it was a really quick project. I sewed one leg, tried it on and freaked to find that it was reallllllly small! But I finished it off and found that actually, they fit perfectly. 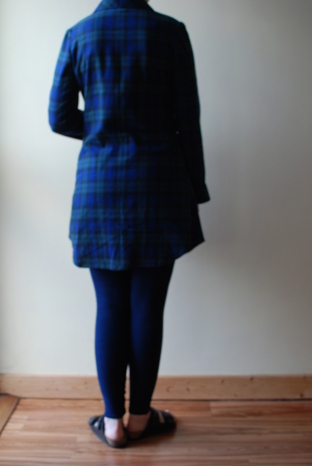 Here is an out-of-focus photo to show the length and fit from the back. The service from Textile Express was very good and I can recommend the navy jodhpur fabric anyway. It’s pretty dense – I was not expecting how unbelievably warm these are. They’re like thermals. Apologies for the brief silence but this week was summer! As summer is usually a brief affair in these parts – sometimes nothing more than a rumour on a waft of warm air that turns out to be just chip van exhaust – everything was suspended until things returned to normal. We had one full week of sun, blue skies, temperatures hovering around 20C and, after the initial shock, it became clear that nobody knew what to do with themselves. I made shorts and practised with the curtains closed. What did you do? I can’t remember if these were part of my summer sewing plan but does that really matter?! 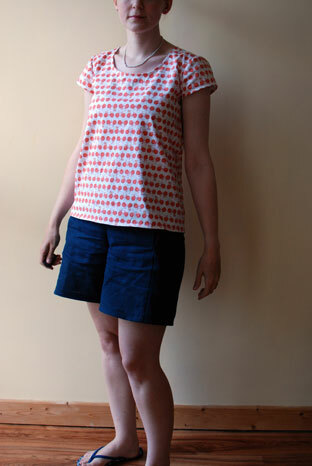 Pattern: Iris shorts by Colette. This is such a ridiculously easy pattern, I’m not sure it really warrants the price tag. Maybe someone more industrious and thrifty would dig around online or on Burda and find something similar. I just wanted something where I knew I didn’t have to make a muslin. It is a perfect beginner’s pattern with lots of leeway for embellishment. Fabric: I bought 3m of navy linen from Murphy Sheehy’s for something like €40 and this took up 90cm of it. I’m using the rest of it for a jacket which I’m in the process of making right now. Linen is linen, you know? 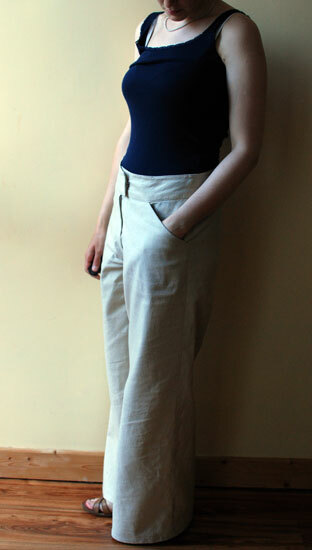 These pictures show what linen shorts will look like if you wear them for most of the week and never hang them up. What swayed me to use this pattern over any other is the pockets. Shorts absolutely must have good front pockets for me since when it’s shorts weather, I usually spend most of my time standing around like this. These have particularly good pockets. As you can probably guess, I lengthened the inner leg for about 3 inches. I don’t have especially beautiful legs so I think an extra 3 inches goes a long way for everyone. 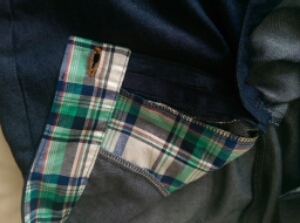 Here is a close up of the pocket detail. You could go really crazy with this pattern and use a different fabric for the front leg panel or just for the pocket linings… or put on back pockets with appliqued lace or add lace to the hems. It’s got lots of options if you think about it. Shown in the photos is my old Scout tee. To be truthful, I never wore this very much at all because it was too big and quite drafty. I adore the fabric so I put it in my mending pile and finally got around to disassembling it. I cut a size 0 out of the pieces and reused the bias binding. It worked perfectly and I’ve been wearing it all week.